El Sancho was on the leading edge of the food truck revolution and set up a humble taco cart on a corner of downtown Bend back in 2010. Two years later they upgraded to a self-constructed “shack”, which now resides on the grounds of Crux Fermentation Project, just outside of the Old Mill District. The El Sancho following reached cult status and, to keep up with demand, the team opened a bricks and mortar shop on DeKalb Avenue in Bend. The menu and vibe reflects the owners’ travels through Mexico, which, combined with the Pacific Northwest’s culture, have created a unique style and approach. The Shop is open seven days a week from 11:00 a.m. – 10:00 p.m. (late night cravings, covered!) and serves up street tacos so authentic you’ll think you’re in Mexico. Piping hot corn tortillas cradle the freshest ingredients for the purest flavors; beef barbacoa, mushroom, pollo, lengua, fried shrimp, grilled fish, chorizo, Oaxacan…if that’s not enough selection, check out their Facebook page for daily specials. The Shop hosts happy hour daily from 3:00 p.m. – 5:00 p.m. – two dollar El Sancho tacos? Yes please! 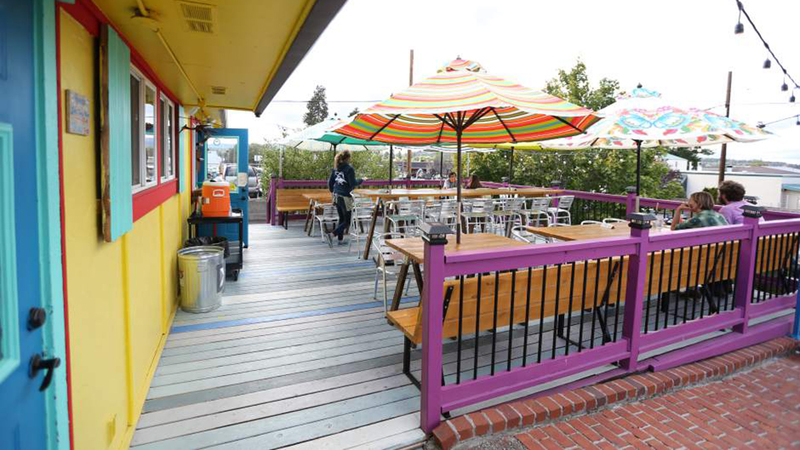 Eat inside the colorful restaurant or take it out on the patio, where dogs are welcome. This is Bend, after all.